I've been eyeing this Giada De Laurentiis recipe for quite some time but never got around to making it. But then I picked up a three-pound package of ground turkey at the grocery store at a great price and decided to make meatballs from it. 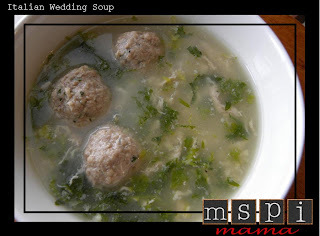 This soup was a great way to use the meatballs. I went ahead and made three pounds of meatballs, baked and froze two-thirds and put the rest in the soup. The original recipe calls for ground beef and ground pork, but the ground turkey works great, too. Another obvious change is the omission of Parmesan cheese. I also added some pasta. Pair this with a loaf of crusty Italian bread. So yummy! To make the meatballs: Stir the first six ingredients in a large bowl to blend. Stir in the turkey. Using 1-1/2 teaspoons for each, shape the meat mixture into 1-inch-diameter meatballs. Place on a baking sheet. Bring a small pot of water to boil and add pasta, cooking according to package directions. Drain and set aside. Bring the broth to a boil in a large pot over medium-high heat. Add the meatballs and curly endive and simmer until the meatballs are cooked through and the curly endive is tender, about 8 minutes. Add in the cooked pasta. Whisk the eggs in a medium bowl to blend. Stir the soup in a circular motion. Gradually drizzle the egg mixture into the moving broth, stirring gently with a fork to form thin stands of egg, about 1 minute. Season the soup to taste with salt and pepper. Tip: This soup is very dependent on a high-quality chicken broth. Do not skimp here by using a salty bouillon or base! But, if you must, check out the Better Than Bouillon line of products. I really like the reduced sodium products.